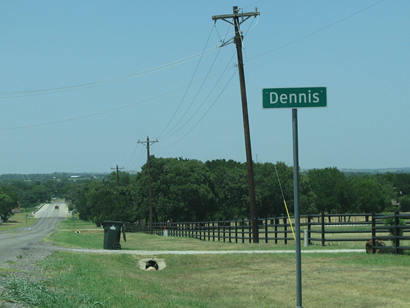 Dennis is an incorporated town in Parker County, Texas, USA. Its elevation is 728 feet (222 m). On May 6, 2017, voters approved incorporation of Dennis. It has a post office, with the ZIP code of 76439. 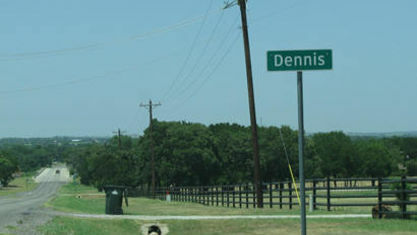 N. M. Dennis, a local judge, founded the community at the spot of a bridge across the Brazos River in 1892. The community's post office was opened in 1895. Today, FM 1543 passes through the community. As of the 2000 census the town has 90 residents. The town includes a post office, a volunteer fire station, Dennis First Baptist Church, and Sugar Tree Golf Course,. The town is served by Brock ISD,. There have been many attempts over the years to open a market in the town, but they have all failed for various reasons. Get to know Dennis better with our featured images and videos.